Product packaging has an incredible impact on our daily lives. Our perceptions of products and the decisions to purchase them are influenced by factors ranging from structure to graphic design to environmental impact. Having spent over 30 years in the packaging industry, the team loves finding new and different packaging ideas that break the mold and deliver something new, maybe even chancy. 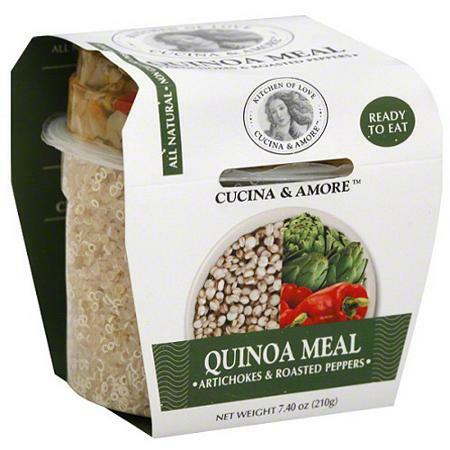 We will examine packaging that catches our eye and share our insights. We welcome your comments and more importantly your questions. In today’s retail environment where shelves are filled with excess visual noise that screams, “Look at me, I have more, I cost less, I smell pretty, I have no additives, I am new!” it’s important to own a disruptive element that acts as a visual trigger to stop and motivate product selection. 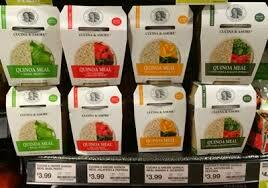 More than ever, white space clearly has a role to play, which is why I highlight CUCINA & AMORE Quinoa Meals. The package design is a great example of effective use of white space, embracing the belief that not every square inch of artistic real estate needs to be filled in order for a design to stand out on shelf. “White space” or space that has not been “filled”, also called negative (empty) space, refers to the exposed color from a piece of paper, unpainted canvas or board that is most often white. When used effectively, white space creates a sense of balance, visual order, emphasis or calm to the communication. Many times, package design suffers from the “fear of white space”, attempting to fill every square inch of surface area with some sort of graphic element, message or detail – believing that if you do, you will somehow achieve a greater bond with your customer. It is staggering that marketing or brand teams invest significant dollars to create a unique package structure or brand identity, only to crowd surfaces with so many elements that the package is left with no quiet space to emphasize what they labored so long to develop. Cucina & Amore artfully uses white as the principal package color, creating packaging without extraneous decoration cluttering the limited surface area, and capitalizing on the ability of white space to isolate and emphasize brand identity. As a color, white communicates simple, pure and straightforward, and in food packaging is fast becoming the “color” to communicate items that are organic, natural or artisanal. The careful use of an accent color provides ready communication on the flavor variety of each package. The look is reflective of the company’s mission of providing prepared food that is healthy and free of unnecessary additives. Further, the packaging structure poses an interesting partnership between interior and exterior package components. The company, obviously aware of the modern consumer who is looking for a 100% complete, ready-to-eat snack or meal that is convenient to transport and dispose of, designed the product’s transparent interior components so they are clearly visible on shelf. When “opened” (band removed), the interior reveals a unique two–part container that is designed to combine at the time of use. To top it off, each package comes complete with a disposable plastic spoon. The structural design is as elemental as the ove r wrap, communicating content and creating the desire to try it. It was a brave choice to not only innovate a new meal delivery format, but to exercise the creative restraint to design a package that with very little, says and does a great deal. What is more, the package system did what good packaging is supposed to do – it caught my attention and drew me into putting it in my cart. If you are looking for attention-grabbing packaging, we invite you to check out our packaging design capabilities and click here or contact us at 920-725-4848.